Fuller Center for Housing founder Millard Fuller saw the affordable housing ministry he and wife Linda started in the early 1970s as a worldwide movement. He knew, as most do, that God’s love extends to the entire world. Millard did not just read that in the Bible — he and Linda witnessed it while traveling to all corners of the world. Reading and believing that God’s love reaches beyond man-made national borders is one thing, but witnessing it is for yourself is a perspective-altering experience that lasts a lifetime. Sandy Buscheck of Orinda, California, knows it. Though her husband, Tim, had been to Thailand several times, such a long journey was not exactly her idea of a good way to spend free time. 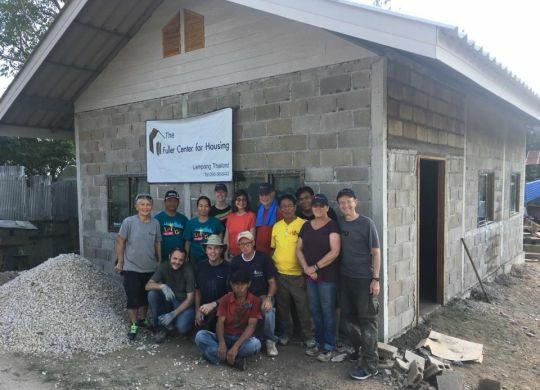 It was only when a team of 10 people from First Presbyterian Church of Berkeley signed up to work with The Fuller Center’s Global Builders program in Lampang, Thailand, that she reluctantly tagged along with her husband. And she’s forever glad she did, as are their Thai homeowner partners — a husband and wife with two daughters, who moved from a bamboo shack to a safe, new Fuller Center home (pictured above). The family’s dire need for a simple, decent home was made even more clear during their trip when one of the homeowners’ daughters fell ill with a fever. “I am so happy that if one of the daughters is sick again, she will be able to be inside in a comfortable room recuperating,” Sandy said. While Sandy helped provide this family with the safety and security of a decent home, she is thankful for the opportunity to have stretched outside of her California comfort zone. Fuller Center home in Thailand. Click here to learn more! Interested in a Fuller Center Global Builders trip to Thailand? Click here!